Ever wanted a type of animal that is fearless, intelligent and almost wolf-like? Then, you may want to consider adopting a German Shepherd Husky Mix! It’s the next best thing! The German Shepherd Husky mix is a hybrid better known as the “Gerberian Shepsky”. It is a new hybrid to the dog breed world and so it’s history and origins seem to be quite mysterious. However, it has been speculated that the German Shepherd Husky mix may have simply been created partly for aesthetics and companionship during the 1980s. Today this bold, powerful dog is recognized by the American Canine Hybrid Club. If you’re walking down the street with such a spectacular dog then you’re sure to grab the attention of onlookers! The German Shepherd is a large dog that can stand up to 65 cm in height and tip the scales at over 40 kgs. Overall, it is going to have a relatively medium to a long head and a strong muzzle. Its eyes are alert and almond shaped, its ears will be set high on its head and will be triangular in shape. The German Shepherd will have a long, lean body built for power. Its coat is often long and dense both traits seen its parent breeds. 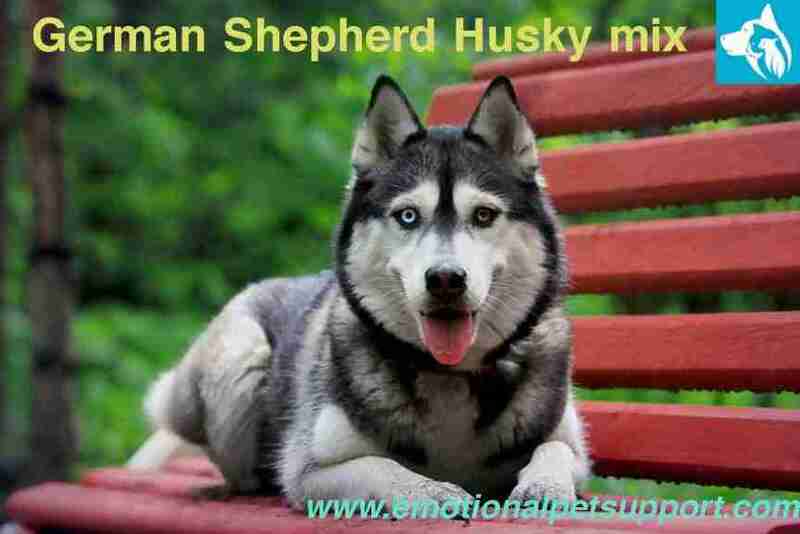 Its coat color can vary from the classic black & tan to mixes of blues, white, cream and gray. In spite of this dog bearing a striking resemblance to a wolf, or even to a Siberian Husky, it is actually, a very friendly, loyal companion. The Siberian Husky was originally bred as a working dog. According to PawCulture, they were created by the Chukchi people of a Siberian tribe over 3,000 years ago. So, without a doubt, it is a dog that’s essentially designed for hard work. Siberian Huskies are loving dog’s that will get along with everyone. Because of its docile nature, the Siberian Husky often makes a great pet for anyone with children or other pets. He’s not the kind of the dog that can be left alone for long hours because it’s likely to get bored. So, this is why the Siberian husky is often best suited for active owners. 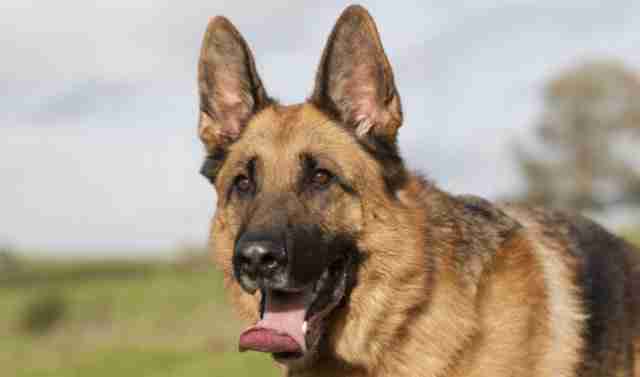 The German Shepherd originated in Germany during the late 1800’s. It was initially bred as a herding dog and was predominantly used on sheep farms. However, over the centuries the German Shepherd began to serve as a military, guarding and a police dog. You must be wondering why did it change its jobs from herding to guarding? Well, this is because the German Shepherd is a hardworking, loyal companion who will instinctively have the desire to protect its owners. It is one of the most intelligent dog breeds and will have no fear. When around children and other smaller pets, it can easily become more gentle and well-natured. This makes him an excellent companion for families. The German Shepherd is not a lap dog or couch potato. It’s built to work, so if left alone for too long it might become anxious and bored. By combining two loyal, hardworking and intelligent dogs you ultimately get the German Shepherd. These hybrids are going to show traits from both its parent breeds. The German Shepherd Husky Mix is an intelligent dog that can learn commands and tricks very quickly. Though it is an intelligent dog, motivated to learn it will require a firm owner. This is because a German Shepherd is instinctively an alpha dog. He is a natural born pack leader that can be demanding, stubborn and bossy if given the chance. This dog is a powerful hybrid not suited to the faint of heart. If it is not trained properly, owners may find it quite hard to handle him as it gets older. As a versatile dog, the German Shepherd Husky Mix can serve many purposes. Because it is so mindful of its surroundings, it can be used as a guard dog as well as a watchdog. The German Shepherd is also quite a protective, courageous companion. As such it often will bond closely to a single owner and can be quite clingy. When around strangers or new pets, your German Shepherd will be quite careful. This is perfectly normal! It simply means that it is keeping a watchful eye on any new face. Puppy school! They may be cute as puppies but these hybrids will grow up to be big and intimidating dogs. It’s essential that owners don’t neglect training and socializing. In order to get a friendly pup, it’s highly recommended that owners invest their time in puppy school and obedience training. Not a Couch Potato: Exercise is essential! These hybrids are very active dogs that will get bored very easily. Owners should aim to provide at least 2 hours of daily exercise per day. Vets know best! 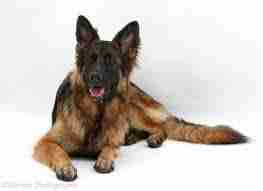 German Shepherds have been known to be genetically predisposed to various diseases. These predispositions can be passed down to the German Shepherd. So, it’s important to take your dog to a vet for a full physical exam at least once a year. Feed It Well: As these hybrids are large, energetic they’re going to consume a lot of food. This can get quite pricey! So, on average aim to feed your German Shepherd at least 3 cups of high-quality kibble each day along with some yummy wet food. Puppyhood is an important time for dogs! During their first few weeks of life, owners should introduce their German Shepherd Husky Mix puppy to as many people, pets, dogs, children, sights, and sounds in order to make sure their puppy grows up to be friendly. This is also the time when owners should begin training their puppy by setting boundaries and house-rules. Be prepared to brush and groom it daily! If you’re looking for a dog that won’t shed blankets of fur then the German Shepherd is not for you. These hybrid pups aren’t really low maintenance, they will shed a lot and can be prone to that nasty wet dog odor. To keep its coat nice and shiny and to reduce shedding load you’re going to have to brush him daily. As with all dogs, brushing its coat isn’t the only thing it will need. Dental disease is quite a common issue seen in our dogs, we often forget that just like humans, dogs too need to have their teeth cleaned on a regular basis. So, it’s often recommended brushing your pup’s teeth at least a few times a week. Overall, the German Shepherd is a large dog that may only reach maturity at 18 to 24 months of age. At 1 month of age, the German Shepherd puppy may start off at 10 lbs. By 3 months of age it may already reach 30 lbs. and by 12 months it will tip the scales at almost 75 lbs. Both the Siberian Husky and German Shepherd are motivated learners. The same goes for the German Shepherd! These hybrids are often easy to train and in fact, consistent training will mentally stimulate your dog. So, this means it’s less likely to get bored and get into trouble. The German Shepherd is a hard-working dog that will enjoy activities that cater to its natural instincts. It’s going to enjoy activities such as obedience training, herding or fieldwork. On occasion, it may be too lazy or stubborn to listen to its owners. Don’t fret! This is just its Husky nature shining through. The German Shepherd is an all-in-one pooch! No one knows why this hybrid may have been created but by combining the gentle nature of the Siberian Husky with fearless nature of the German Shepherd you ultimately get the friendliest wolf-dog. Thinking of adopting a German Shepherd Husky mix? Please be aware, they are quite expensive! A cheap German Shepherd Husky puppy in the US can go anywhere from $400 to $500. Better bred and more expensive ones can go up to $750 and a $1000 based on the breeder and genetics of the parent breeds. The German Shepherd Husky mix isn’t rare dogs. Today they are constantly being bred by amateur breeders. But, as they are a relatively new hybrid, you may have some trouble searching for a reputable breeder in your area. If you want to save a life then consider searching for these hybrids at your local pet shelter or SPCA. Unfortunately, many large breeds such as the German Shepherd Husky become hard to handle once they reach adulthood. So, they’re often given up to shelters by their owners. Regardless, even older dogs in shelters make excellent companions. All they need is a little bit of training and a whole lot of love! How long your German Shepherd lives depends on many factors such as it’s health, level of exercise, diet, and genetics. But, on average the lifespan of the German Shepherd is often 10 to 13 years. The next Ice Age dog: Both the Siberian Husky and German Shepherd have dense, double coats. Naturally, these dogs are built to handle the extreme cold weather. Your German Shepherd will be the same! It’s just going love the snow. Squirrels and Rabbits! Some German Shepherd Husky Mix may have a high hunting drive. They will love to chase squirrels and rabbits, so be wary if you own small pets. A sharp learner: It can learn distinctive whistle and commands: Like many herding dogs, the German Shepherd is able to learn the difference between various whistles. A miniature Direwolf: Since the release of the famous Game of Thrones series, these dogs have become increasingly popular due to their similar resemblance to the dire wolves. My unique eyes: Heterochromia is a condition commonly seen in the German Shepherd Husky Mix. Heterochromia is a condition that often results in dogs attaining two different eye colors. Don’t get mad if I’m naughty: Naturally, the German Shepherd Husky Mix has derived from two very hard-working dogs. So, if your German Shepherd is left home alone for too long then it’s going to get bored and it will show that it’s bored through behaviors such as chewing, excessive barking, digging and going through garbage. The escape artist: The German Shepherd is an active dog. Taking him for a long walk may not be enough to satisfy its inner Indiana Jones! These dogs are explorers and will do their best to escape their backyard in search of adventure. Tumbleweeds of fur: Because of its dense, long fur coats. The German Shepherd Husky Mix is going to shed a lot! So be prepared to be covered in doggie hair. Whether you’re in search of a friendly wolf dog or your next adventure buddy. The German Shepherd is definitely the kind of pup that will be ready to be by your side for years to come!